Interior of District #63 school. Miriane Jeans is the teacher in this photo. MODERN ADDRESS Located at 12288 Judy Ave. in Hugo. Enrollment in 1876: 36 students. In 1898: 41 students. 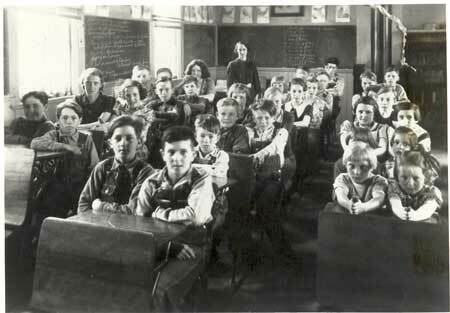 In 1938: 24 students. Was located in the SE corner of Oneka, formed after District 51 divided. The ceiling was painted in 1938. Other teachers: (before 1898): Johann Parle, Lizzie Withrow, Miss Boreen, Evelyn Smithson, Louise Lammers, Josie Greenwalt.